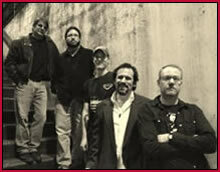 Hot Wing Jones has been described as a garage band for adults. While this may accurately describe this band’s public persona, it doesn’t aptly describe this band’s dedication to their musical pursuits. If one listens to their latest album Tanker A & Other Short Stories or attends one of their live performances, one is left with little doubt that this is a serious group of serious musicians. The members of the band each have a talent for making it look effortless during their live shows and are not afraid to take chances, flirting with different styles and directions. They are definately built on a solid foundation classic rock and roll but at different times they can lean heavily towards country, jazz, or funk, making a Hot Wing Jones show an interesting and tremendously entertaining time.